"Wilson center" redirects here. For the center of the Wilson confidence interval, see Binomial proportion confidence interval § Wilson score interval. The Woodrow Wilson International Center for Scholars (or Wilson Center), located in Washington, D.C., is a United States Presidential Memorial that was established as part of the Smithsonian Institution by an act of Congress in 1968. It is also a highly-recognized think tank, ranked among the top ten in the world. Named in honor of President Woodrow Wilson, the only President of the United States to hold a PhD, its mission is "to commemorate the ideals and concerns of Woodrow Wilson by: providing a link between the world of ideas and the world of policy; and fostering research, study, discussion, and collaboration among a full spectrum of individuals concerned with policy and scholarship in national and world affairs." The Ronald Reagan Building and International Trade Center, where the Wilson Center is located. Most of the Center's staff form specialized programs and projects covering broad areas of study. These programs and projects organize and host conferences and seminars, and support many kinds of research, communication, and publication on topics relevant to their areas. The Center also publishes a digital magazine, the Wilson Quarterly. In 2013 and again in 2014, the Wilson Center was ranked by the Go To Think Tank Report at the University of Pennsylvania as one of the top ten think tanks in the world. The 2014 rankings named the Wilson Center as 5th best overall in the United States, 4th in the world for international development, 8th in the world for international affairs, and 27th in defense and national security. 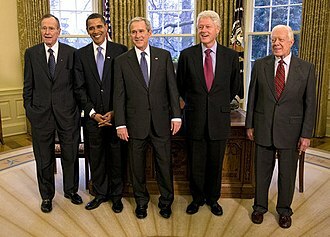 It was also ranked the "#1 think tank to watch" in the United States and 11th best-managed think tank in the world. The Center is a public–private partnership. Approximately one-third of the Center's operating funds come annually from an appropriation from the U.S. government, and the Center itself is housed in a wing of the Ronald Reagan Building, a federal office building where the Center enjoys a 30-year rent-free lease. The remainder of the Center's funding comes from foundations, grants and contracts, corporations, individuals, endowment income, and subscriptions. Because of its historic reliance on congressional appropriations, the Center posts on its website a Plan for Federal Funding Hiatus. The Board of Trustees, currently led by Chairman Frederic V. Malek, are appointed to six-year terms by the President of the United States. Trustees serve on various committees including executive, audit and finance, development, investment, fellowship, and investment policy. Peter J. Beshar, Executive Vice President & General Counsel, Marsh & McLennan Companies, Inc.
Each year, the Woodrow Wilson Center gives out several awards recognizing members of the community who have shown an outstanding commitment to President Woodrow Wilson's dream of integrating politics, scholarship, and policy for the common good. Recipients fall into two award categories, those receiving the award for Public Service, and those receiving the award for Corporate Citizenship. Awardees are selected by the Board, and distributed at dinners benefitting the Center in different locations each year. Most of the Center's staff form specialized programs and projects covering broad areas of study. There are approximately 14 programs, some of which are described below. Established in 1999, the Wilson Center's Africa Program focuses on international affairs issues as affect Africa, conducts programmatic work to train and mentor rising leaders in Burundi and the Democratic Republic of the Congo, and facilitates meetings between the policymaking communities of Washington, D.C., and Africa. Its current director is Monde Muyangawa. The Wilson Center's Asia Program analyzes the politics, policy, culture, and issues of the broader Asia-Pacific region, encompassing a region stretching from Afghanistan to Japan. Since its founding in 2006, the Brazil Institute has focused on analyzing and convening panels to discuss Brazilian politics, economics, and the country's global profile. Founded in 2001, the Canada Institute analyzes Canada-U.S. relations, trade, and Canada's international role as polar ice melts. The Cold War International History Project (CWIHP) supports the full and prompt release of historical materials by governments on all sides of the Cold War, seeking to integrate new sources, materials and perspectives from the former Eastern Bloc with the historiography of the Cold War. In particular, it disseminates new information and perspectives from previously inaccessible sources from the former Communist world on the history of the Cold War. In 2011, the Woodrow Wilson International Center for Scholars partnered with East China Normal University (ECNU), Shanghai, to launch the ECNU-Wilson Center Cold War Studies Initiative, it is supported by the Wilson Center's flagship Cold War International History Project (CWIHP) and ECNU's Cold War International Studies Center, the first Cold War Studies center in China. The Environmental Change and Security Program (ECSP) was founded in 1994 to explore the connections among environmental, health, and population dynamics and their links to conflict, human insecurity, and foreign policy. The History and Public Policy Program (HAPP) at the Woodrow Wilson Center focuses on the relationship between history and policy-making and seeks to foster open, informed and non-partisan dialogue on historically relevant issues. The Kennan Institute (KI), founded in 1974 as a division of the Woodrow Wilson International Center for Scholars, is committed to improving American understanding of Russia and the successor states to the Soviet Union. The Kissinger Institute analyzes the political, economic, historical, and cultural relationships between the United States and China. Named after Henry A. Kissinger, who as secretary of state was instrumental in opening diplomatic relations between the U.S. and China. Its current director is Robert Daly. The Wilson Center's Mexico Institute conducts original research and analysis on Mexico's economy, convenes meetings, and proposes public policies. The institute focuses on five key areas: Mexico's security and rule of law, economic competitiveness (both of Mexico and the transnational economies along the border), migration, the U.S.-Mexico border, and energy issues. The Middle East Program, launched in 1998, analyzes geopolitical, cultural, and social trends in the Middle East and North Africa region. From May 8 until August 21, 2007, Dr. Haleh Esfandiari, then-director of the Middle East Program, was imprisoned in Tehran, Iran, in the Evin Prison. She was released on bail and had her passport returned to her on September 2, 2007. Esfandiari was then permitted to leave Iran. As of 2015, the current director of the Middle East Program is Dr. Henri Barkey. The History and Public Policy Program (HAPP) sponsored this 2009–2010 exhibit in the Memorial Hallway, Polish People's Republic—So Far Away and So Close By, which depicted key events in Polish history from 1944 to 1989. The North Korea International Documentation Project translates and disseminates newly declassified documents about North Korea, largely drawing from its former communist allies. The documents are then distributed on the Wilson Center's Digital Archive site and curated in the project's dossier series. STIP focuses on understanding bottom-up, public innovation; top-down, policy innovation; and, on supporting responsible and equitable practices at the point where new technology and existing political, social, and cultural processes converge. ^ "Archived copy" (PDF). Archived from the original (PDF) on 2014-03-07. Retrieved 2014-02-25. ^ "About Woodrow Wilson International Center for Scholars". Wilsoncenter.org. Retrieved 2014-02-01. ^ "Leadership". 7 June 2011. ^ "Programs @ The Woodrow Wilson Center". Wilsoncenter.org. 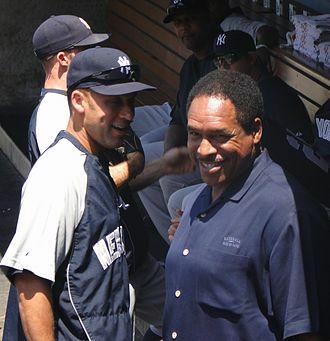 Archived from the original on 2011-06-29. Retrieved 2014-02-01. ^ "The Burundi Leadership Training Program". Wilson Center. 2008-01-25. Retrieved 2017-11-12. ^ "Monde Muyangwa". Wilson Center. Retrieved 2017-11-12. ^ "About". Wilson Center. Retrieved 2017-11-12. ^ "Robert Daly". 22 July 2011. ^ "About". 11 July 2011. ^ Wright, Robin (May 8, 2007). "Tehran Jails Iranian American Scholar After Long House Arrest". The Washington Post. ^ "Photo Exhibition: Polish People's Republic—So Far Away and So Close By". Wilsoncenter.org. 2014-01-28. Archived from the original on 2011-06-05. Retrieved 2014-02-01. ^ "NKIDP e-Dossier Series". 7 July 2011. 1968 establishments in Washington, D.C. It took place in Paris during 1919 and involved diplomats from more than 32 countries and nationalities. The main result was the Treaty of Versailles with Germany, which in section 231 laid the guilt for the war on the aggression of Germany and this provision proved humiliating for Germany and set the stage for the expensive reparations Germany was intended to pay. They met together informally 145 times and made all the major decisions, the conference opened on 18 January 1919. 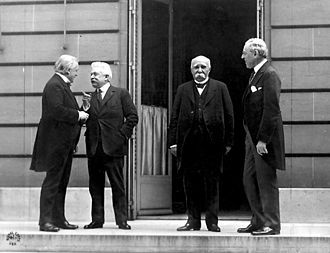 Key recommendations were folded into the Treaty of Versailles with Germany, the five major powers controlled the Conference. Amongst the Big Five, in practice Japan played a small role, the four met together informally 145 times and made all the major decisions, which in turn were ratified by other attendees. The open meetings of all the approved the decisions made by the Big Four. 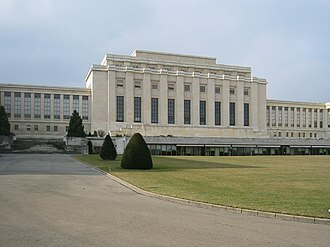 The conference came to an end on 21 January 1920 with the inaugural General Assembly of the League of Nations, the main result was the Treaty of Versailles, with Germany, which in section 231 laid the guilt for the war on the aggression of Germany and her allies. This provision proved humiliating for Germany and set the stage for very high reparations Germany was supposed to pay, republican Germany was not invited to attend the conference at Versailles. Representatives of White Russia were present, a central issue of the Conference was the disposition of the overseas colonies of Germany. The British dominions wanted their reward for their sacrifice, Australia wanted New Guinea, New Zealand wanted Samoa, and South Africa wanted South West Africa. 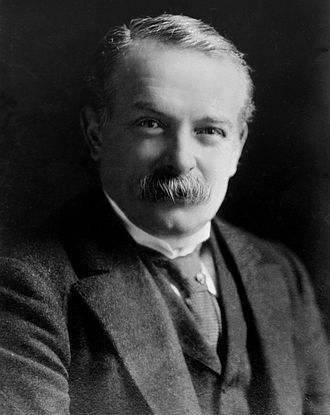 Wilson wanted the League of Nations to administer all the German colonies until such time as they were ready for independence, Lloyd George realized he needed to support his dominions, and he proposed a compromise that there be three types of mandates. Mandates for the Turkish provinces were one category, they would be divided up between Britain and France and the others finally went along with the solution. The dominions received Class C Mandates to the colonies they wanted, Japan obtained mandates over German possessions north of the equator. 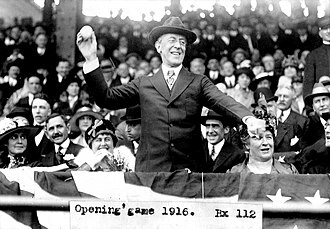 The American entry into World War I came in April 1917, after two and a half years of efforts by President Woodrow Wilson to keep the United States neutral. 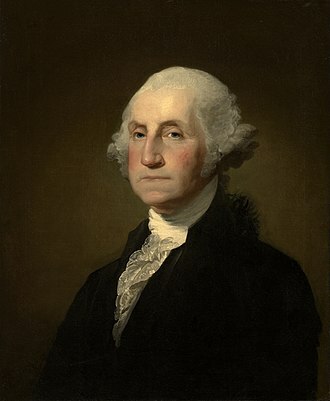 Apart from an Anglophile element supporting the British, American public opinion went along with neutrality at first, the sentiment for neutrality was strong among Irish Americans, German Americans and Scandinavian Americans, as well as among church leaders and women. On the other hand, even before World War I broke out, the citizenry increasingly came to see the German Empire as the villain after news of atrocities in Belgium in 1914, and the sinking of the passenger liner RMS Lusitania in May 1915. Wilson made all the key decisions and kept the economy on a basis, while allowing banks to make large-scale loans to Britain. However, he did enlarge the United States Navy, in early 1917, Germany decided to resume all-out submarine warfare on every commercial ship headed toward Britain, realizing that this decision would almost certainly mean war with the U. S.
Germany offered to help Mexico regain territories lost in the Mexican–American War in the Zimmermann Telegram, publication of that offer outraged Americans just as German U-boats started sinking American ships in the North Atlantic. 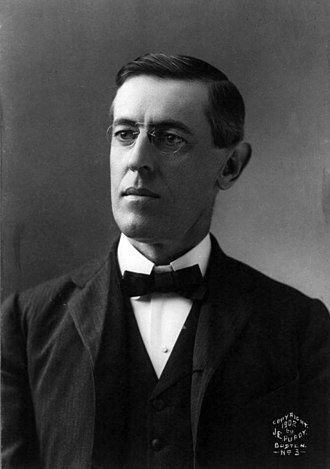 Wilson asked Congress for a war to end all wars that would make the safe for democracy. 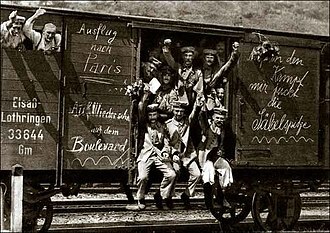 On December 7,1917, the U. S. declared war on Austria-Hungary, United States insisted on maintaining the traditional rights of neutrals, protested strongly against violations by Britain and especially by Germany. The British seized American ships for supposed violations, the Germans sank them without warning, in violation of international law that said sailors must be allowed an opportunity to reach their lifeboats. A critical indirect strategy used by both sides was the blockade, the British Royal Navy successfully stopped the shipment of most war supplies and food to Germany. Neutral American ships that tried to trade with Germany were seized or turned back by the Royal Navy who viewed such trade as in conflict with the Allies war efforts. The strangulation came about slowly, because Germany and the Central Powers controlled extensive farmlands. 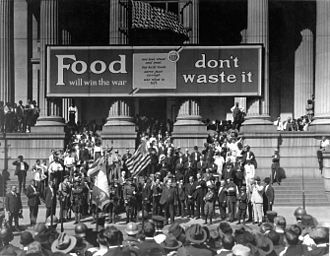 It was eventually successful because Germany and Austria-Hungary had decimated their agricultural production by taking so many farmers into their armies, by 1918, German cities were on the verge of starvation, the front-line soldiers were on short rations and were running out of essential supplies. England wants to starve us, said Admiral Alfred von Tirpitz, the man who built the German fleet and we can play the same game. We can bottle her up and destroy every ship that endeavors to break the blockade, unable to challenge the more powerful Royal Navy on the surface, Tirpitz wanted to scare off merchant and passenger ships en route to Britain. While Germany had only nine long-range U-boats at the start of the war, Americans insisted that the drowning of innocent civilians was barbaric and grounds for a declaration of war. The British frequently violated Americas neutral rights by seizing ships, Wilsons top advisor, Colonel Edward M.
The Pancho Villa Expedition—now known officially in the United States as the Mexican Expedition but originally referred to as the Punitive Expedition, U. S. The expedition was launched in retaliation for Villas attack on the town of Columbus, New Mexico, the declared objective of the expedition by the Wilson administration was the capture of Villa. The Constitutionalist forces used arms at the town of Parral to resist passage of a U. S. Army column, the U. S. mission was changed to prevent further attacks on it by Mexican troops and to plan for war in the eventuality it broke out. 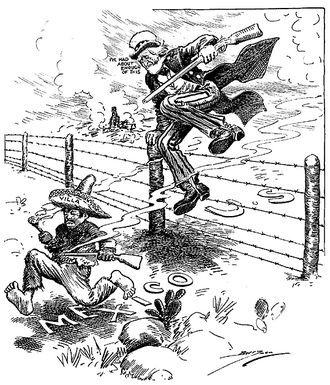 When war was averted diplomatically, the expedition remained in Mexico until February 1917 to encourage Carranzas government to pursue Villa, feeling betrayed, Villa began attacking U. S. nationals and their property in northern Mexico. 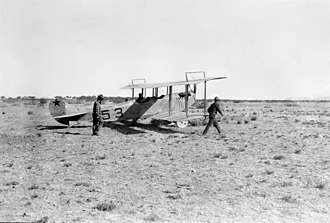 On November 26,1915, Villa sent a force to attack the city of Nogales and in the course of the ensuing battle, engaged with American forces before withdrawing. On January 11,1916, sixteen American employees of the American Smelting and Refining Company were removed from a train near Santa Isabel, brigadier General John J. 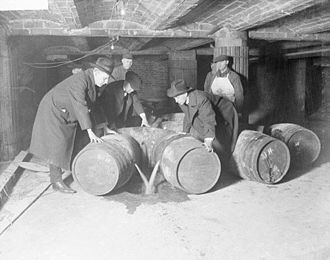 Raids were so commonplace, that the rumor was not seen as credible. 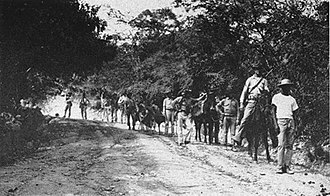 Ten civilians and eight soldiers were killed in the attack, the raiders burned the town, stole horses and mules, and seized machine guns and merchandise, before fleeing back to Mexico. However, Villas soldiers had suffered losses, with at least sixty-seven dead. Many of the casualties were inflicted when the machine gun troop of the 13th Cavalry led by 2nd Lt. John P, about thirteen of Villas wounded died of their wounds, and five wounded Villistas taken prisoner by the Americans were tried and hanged for murder. Local lore in Columbus holds that the attack may have been caused by a merchant in Columbus who supplied Villa with arms and ammunition. Villa is said to have several thousand dollars in cash for the weapons. The next day, acting on the recommendations of the commanders of his cavalry regiments and this can and will be done in entirely friendly aid to the constituted authorities in Mexico and with scrupulous respect for the sovereignty of that Republic. The Thomas Woodrow Wilson Boyhood Home is located in Columbia, South Carolina and was one of the childhood homes of the 28th President of the United States, Woodrow Wilson. The home, built in 1872, was the only ever owned by the Wilson family. They lived there for four years, before Wilsons father resigned his position as pastor, a grassroots movement in 1928 preserved the home and prevented its scheduled demolition. It opened to the public as a museum in 1932, the house is furnished with period pieces from the 1850s–1870s, although only a few were owned by the Wilson family. They include, although he was not born in the house, stewardship of the home was granted to the Historic Columbia Foundation in 1967. In October 2005, the closed to tours in preparation for a complete renovation of the structure. In April 2009 the first of three phases of renovation began, starting with structural repairs, phase two, which included a new building on the property, electrical upgrades and minor carpentry work, was completed in late 2012. The Federal Trade Commission is an independent agency of the United States government, established in 1914 by the Federal Trade Commission Act. Its principal mission is the promotion of consumer protection and the elimination and prevention of anticompetitive business practices, the Federal Trade Commission Act was one of President Woodrow Wilsons major acts against trusts. 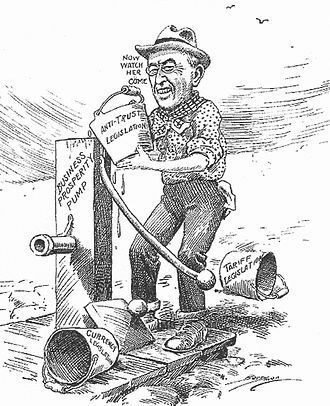 Trusts and trust-busting were significant political concerns during the Progressive Era. Since its inception, the FTC has enforced the provisions of the Clayton Act, over time, the FTC has been delegated with the enforcement of additional business regulation statutes and has promulgated a number of regulations. 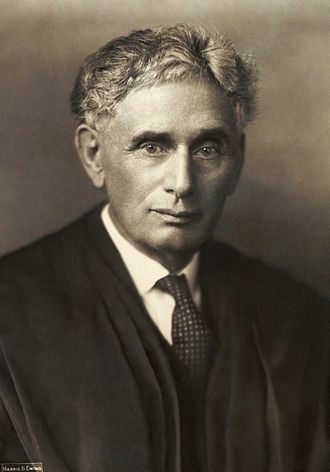 He would make the first speech on the House floor advocating its creation on February 21,1912, though the initial bill did not pass, the questions of trusts and antitrust dominated the 1912 election. 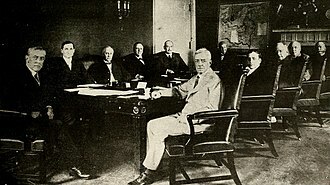 With the 1912 presidential election decided in favor of the Democrats and Woodrow Wilson, the national debate culminated in Wilsons signing of the FTC Act on September 26, with additional tightening of regulations in the Clayton Antitrust Act three weeks later. The new Federal Trade Commission would absorb the staff and duties of Bureau of Corporations, previously established under the Department of Commerce, the following table lists commissioners as of March 2017. 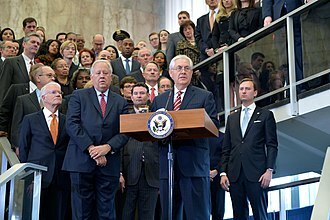 Recent former commissioners were, The Bureau of Consumer Protections mandate is to protect consumers against unfair or deceptive acts or practices in commerce, with the written consent of the Commission, Bureau attorneys enforce federal laws related to consumer affairs and rules promulgated by the FTC. Its functions include investigations, enforcement actions, and consumer and business education, areas of principal concern for this bureau are and marketing, financial products and practices, telemarketing fraud and identity protection, etc. The bureau is responsible for the United States National Do Not Call Registry, under the FTC Act, the Commission has the authority, in most cases, to bring its actions in federal court through its own attorneys. In some consumer protection matters, the FTC appears with, or supports, the Bureau of Competition is the division of the FTC charged with elimination and prevention of anticompetitive business practices. 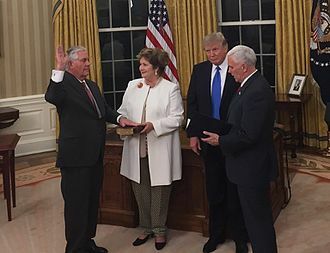 Rex Wayne Tillerson is an American energy executive, civil engineer, and diplomat who is the 69th and current United States Secretary of State, serving since February 1,2017. 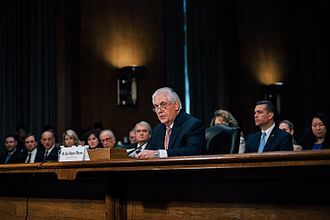 Tillerson joined ExxonMobil in 1975 and rose to serve as the chairman, Tillerson began his career as an engineer and holds a bachelors degree in civil engineering from the University of Texas at Austin. By 1989 he had become manager of the Exxon USA central production division. In 1995, he became president of Exxon Yemen Inc. in 2006, Tillerson was elected chairman and chief executive officer of Exxon, the worlds 6th largest company by revenue. Tillerson retired from Exxon effective January 1,2017, and was succeeded by Darren Woods and he is a member of the National Academy of Engineering. Tillerson is a volunteer with the Boy Scouts of America. He is a contributor to Republican campaigns, although he did not donate to Donald Trumps presidential campaign. 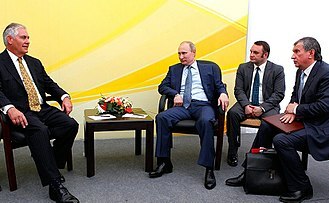 In 2014, who had made deals on behalf of Exxon with Russian President Vladimir Putin. He has previously been the director of the joint US-Russian oil company Exxon Neftegas, Tillerson was born on March 23,1952, in Wichita Falls, the son of Patty Sue and Bobby Joe Tillerson. He was raised in Vernon, Stillwater and Huntsville and his sister Rae Ann Hamilton is a physician and resides in Abilene, Texas. The other, Jo Lynn Peters, is a high school educator, active in the Boy Scouts of America for most of his life, he earned the rank of Eagle Scout in 1965. At 14 he began to work as a bus boy in the student union building at Oklahoma State University, two years in 1968 he became a janitor working in one of the engineering buildings at the University. Tillerson graduated from Huntsville High School in 1970 and he received a bachelors degree in civil engineering from the University of Texas at Austin in 1975. During his time at UT Austin, he was involved with the Tejas Club, the Longhorn Band, in 2006 he was named a Distinguished Engineering Graduate. Tillerson joined Exxon Company, U. S.
The League of Nations was an intergovernmental organisation founded on 10 January 1920 as a result of the Paris Peace Conference that ended the First World War. It was the first international organisation whose mission was to maintain world peace. Its primary goals, as stated in its Covenant, included preventing wars through collective security and disarmament, at its greatest extent from 28 September 1934 to 23 February 1935, it had 58 members. 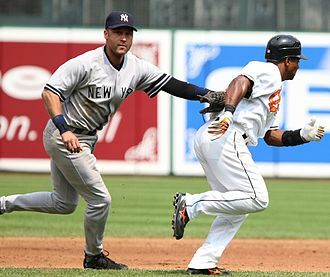 The diplomatic philosophy behind the League represented a shift from the preceding hundred years. The League lacked its own armed force and depended on the Great Powers to enforce its resolutions, keep to its economic sanctions, the Great Powers were often reluctant to do so. 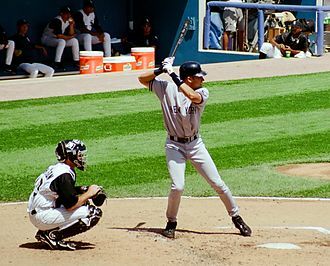 Sanctions could hurt League members, so they were reluctant to comply with them, after a number of notable successes and some early failures in the 1920s, the League ultimately proved incapable of preventing aggression by the Axis powers in the 1930s. Germany withdrew from the League, as did Japan, Spain, the onset of the Second World War showed that the League had failed its primary purpose, which was to prevent any future world war. The League lasted for 26 years, the United Nations replaced it after the end of the Second World War on 20 April 1946 and inherited a number of agencies and organisations founded by the League. As historians William H. Harbaugh and Ronald E. Powaski point out, the organisation was international in scope, with a third of the members of parliaments serving as members of the IPU by 1914. 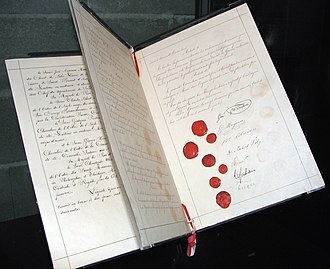 Its aims were to encourage governments to solve disputes by peaceful means. Annual conferences were held to help refine the process of international arbitration. Its structure consisted of a council headed by a president, which would be reflected in the structure of the League, at the start of the 20th century, two power blocs emerged from alliances between the European Great Powers. 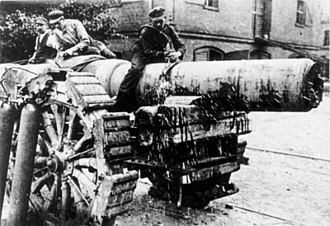 It was these alliances that, at the start of the First World War in 1914 and this was the first major war in Europe between industrialised countries, and the first time in Western Europe that the results of industrialisation had been dedicated to war. Bethany Chapel in a drawing from the 8/15/03 Post. A mission of New York Avenue Presbyterian Church, it was built in 1874 and appears to have been razed for the construction of Federal Triangle. The 14th Street NW facade of the Ronald Reagan Building in 2006. Women's suffragists parade in New York City in 1917, carrying placards with the signatures of more than a million women. Sergeant Major John H. Quick of the US Marines raises the American flag over Veracruz. 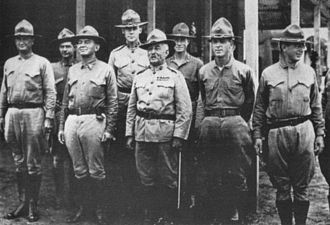 The senior officers of the 1st Marine Brigade photographed at Veracruz in 1914: Front row, left to right: Lt. Col. Wendell C. Neville; Col. John A. Lejeune; Col. Littleton W. T. Waller, Commanding; and Maj. Smedley Butler. A World War I era draft card. Secretary of War Newton Baker draws the first draft number on 20 July 1917. A portion of the Telegram as decrypted by British Naval Intelligence codebreakers. The word Arizona was not in the German codebook and thus had to be split into phonetic syllables. Florence Bayard Hilles, chairman of the Delaware Branch of the NWP and member of the national executive committee, was arrested picketing the White House July 13, 1917, sentenced to 60 days in Occoquan Workhouse. She was pardoned by President Wilson after serving three days of her term. 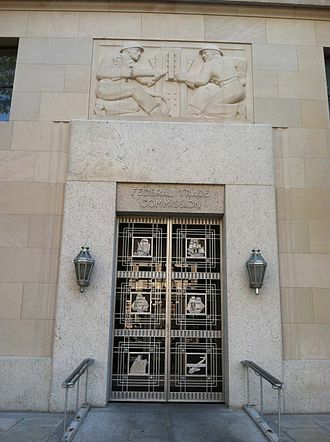 Apex Building, built in 1938 (FTC headquarters) in Washington, D.C.
Virginia congressman Henry D. Flood introduced the declaration of war. Wilsonian Armenia according to the Treaty of Sèvres.